Tablet stands and cases are equally popular with users these days like the devices they are designed for. Apple’s iPad has seen the largest number of fun cases and stands developed from a large number of manufacturers from around the world and now there is another one in the market all the way from Austria. 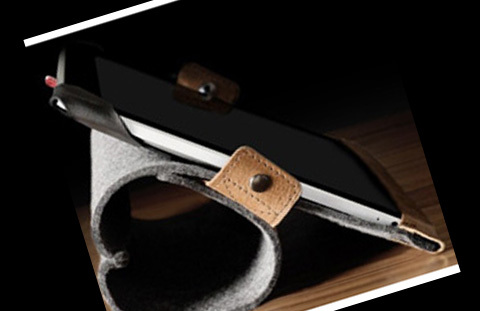 The new Tilt iPad Case is hand made from vegetable-tanned leather and felt so each case is different from the others. It’s lightweight and flexible and provides screen coverage when closed. You can fold it for comfortable typing and easy video watching. You can pre-order your Tilt iPad Case for $ 115 plus shipping charges and it will be sent to you from Austria which explains the steep price tag. Tilt is different and innovative from almost all other iPad cases available in the market and hence may see orders poring in from local users and even international ones. So if you’re willing to part with above $ 115, order your Tilt now and wait for the delivery.